These planeswalker deck cards that search for their marquee card are a real godsend to players with more limited card pools. I’m glad they decided each color combination is allowed to have them – some of the designers seem to espouse a more rigid view of the color pie, but stuff like that is often not as important as people enjoying your product. I realize that they’re also pretty good in singleton formats. The planeswalkers they search for are maybe not in the power tier of someone like Liliana of the Veil, but consistency is always strong, in any form. Dovin’s is pretty simple and goes with his background as a bureaucrat, but it’s definitely a solid tempo card and sets up your mid- to late-game card advantage generator. It’s also worth noting that it’s an instant, unlike Time Ebb and Temporal Spring before it. The added flexibility makes it – and the Dovin it goes with – worth looking at. Being able to bounce a tapped creature to the top of its owner’s library is a deceptively powerful effect, as it can set an opponent back a turn and counter their attempts to swing through with a large attacker. 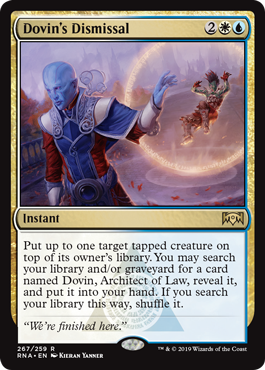 Of course, the value of Dovin’s Dismissal largely is its ability to get Dovin from your library or graveyard while still representing a threat through to the end of your opponent’s turn. While, again, the Dovin it fetches is the bad one, redundancy is always a potent weapon, and the effect isn’t too bad itself. Definitely a good inclusion if you’re using the Dovin it pairs with.